Melissa Stewart is the author of over 100 nonfiction books for children including Under the Snow, No Monkeys, No Chocolate and Inside Volcanoes. She is a prolific writer and researcher of all things science, and I had the pleasure of hosting her for an author event at my school last week. 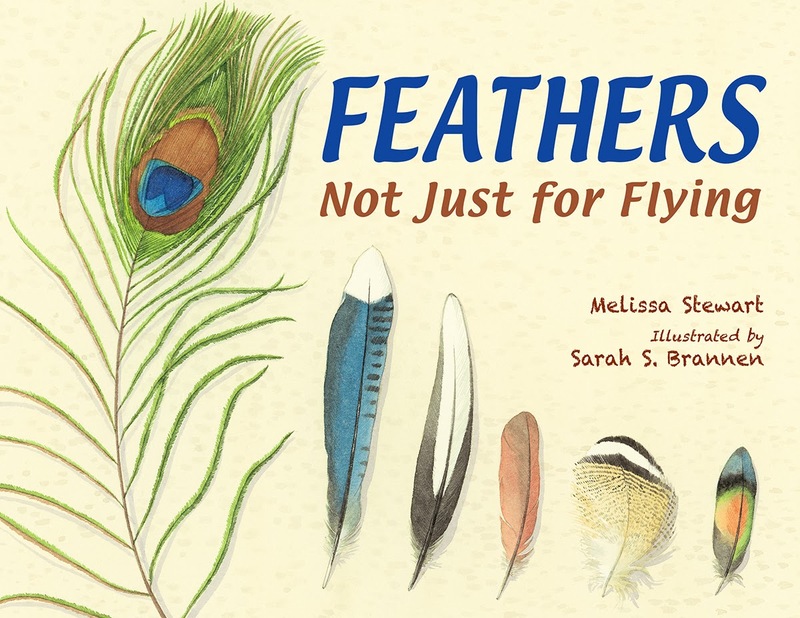 I'm really excited about Melissa's latest science picture book, Feathers: Not Just for Flying. This is a book that is going to please everyone: children, parents, teachers and librarians. Kids will enjoy learning about how different species of birds use their feathers. Teachers will want to share the book with classes because of the rich language and similes used to describe the feathers and their uses. Parents and grandparents will want to share this book with the children in their lives. The book is designed to look like a scrapbook full of bird photos. The primary text at the top of the page is poetic as it introduces readers to the various functions of feathers. Secondary text placed in boxes that appear as paper taped into a scrapbook, provide more information about the birds. Stewart pointed out that this format makes the book accessible to both younger children and older children. "Feathers can shade out sun like an umbrella...or protect skin like sunscreen." Brannen's gorgeous watercolor illustrations will make readers think they are looking at real feathers. The illustrator effectively captures the colors, textures, and shapes of the feathers. Captions and labels provide readers with more information about each feather and bird. Bird lovers and science-minded readers will enjoy reading the page about the different feather designs. Pair this book with Look Up! Bird Watching in Your Own Backyard to inspire readers to notice birds in their own lives. Visit the Charlesbridge Publishing site to download a readers' theater script and a curriculum guide. Images published with permission from Charlesbridge. this is such a neat book - I love the scrap-booky look, too.